Beech Cottage in Windermere sleeps 3 people. 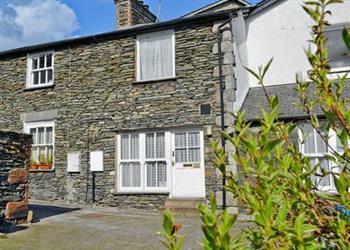 Beech Cottage is a cosy holiday cottage is situated right in the heart of the beautiful town of Windermere. Beech Cottage is tucked away behind the shops so away from the hustle and bustle of everyday life, yet within walking distance of this small town. The location is perfect, with a variety of shops, restaurants and outdoor pursuits nearby. Walking in this area is excellent, whether you opt for a gentle lakeside stroll or a vigorous hike up the fells. For breath taking, panoramic views of the lake and mountains, take the short trek up to Orrest Head. Also available close by is cycling, horse riding, gorge scrambling, a cinema and the Beatrix Potter Exhibition. Bowness, Coniston Water, Kendal, the Furness Peninsula, Morecambe Bay and the Lakeland Mountains are within easy reach. Discover interesting heritage sites, historic houses, colourful gardens and many other attractions, including the National Park Visitor Centre at Brockhole, the Windermere on Water Festival and the Windermere Air Show. Shop, pub and restaurant 10 yards. Ground floor at Beech Cottage: Living/dining room/kitchen with beams. First floor: 1 double bedroom with additional single. Shower room with toilet. Economy 7 central heating, electric and bed linen included. Freeview TV. DVD. CD. Electric cooker. Microwave. Fridge/Freezer. Car park 5 yards (at cost). No smoking. Holidays at Beech Cottage run from Holidays run from Friday to Friday. Beech Cottage is in Cumbria; should you be on the lookout for a special offer, you can find all the special offers in Cumbria. It's always worth checking to see what is on offer at the moment. Do you want to holiday near Beech Cottage (29605), you can see other cottages within 25 miles of Beech Cottage; have a look to find your perfect holiday location.